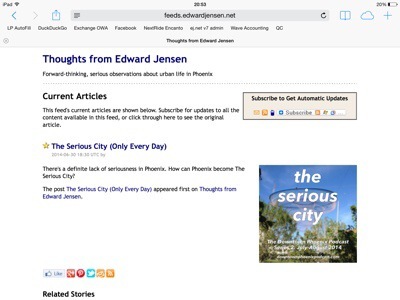 Some housekeeping: If you receive new edwardjensen.net posts in an RSS reader, please read. A bit of housekeeping: In light of Google’s lack of support for its Feedburner service, we have migrated over to Feedblitz for both this website and our sister project, The Downtown Phoenix Podcast. To keep receiving new posts from edwardjensen.net in your feed reader, please ensure that this is in your feed reader of choice: http://feeds.edwardjensen.net/edwardjensen-net. We apologize for the inconvenience and we return to our regularly scheduled posts. It was time to do a little Spring Cleaning on the blog and I’ve re-launched the blog. Happy February! 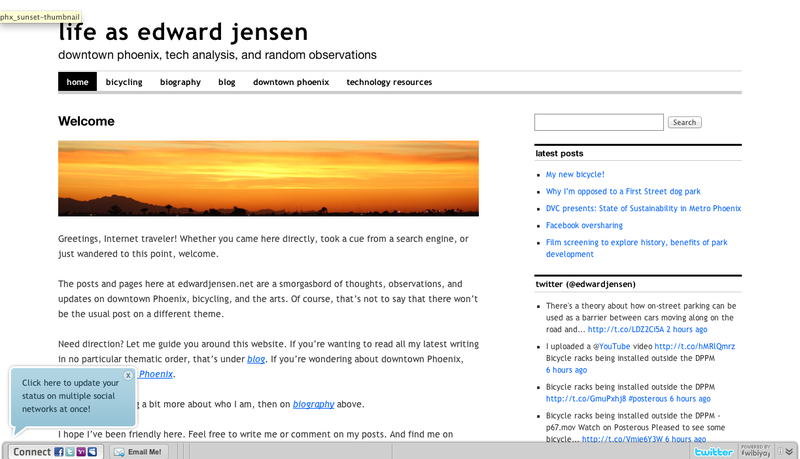 There are a few new features on the latest version of edwardjensen.net that you should know. First, page organization is handled a little differently. I’m beginning to focus on three key areas: bicycling, downtown Phoenix, and technology. Those key areas are in the header bar above. You can also find my current biography (under biography) and the latest posts (under blog). Over on the right-hand side are other links to other resources that I’ve found useful online and to my various profiles on various networks. Find and follow me there. There might be a few hiccups along the way. In exchange for that, I’m going to be introducing some new features. Bear with me…and we’ll all win.